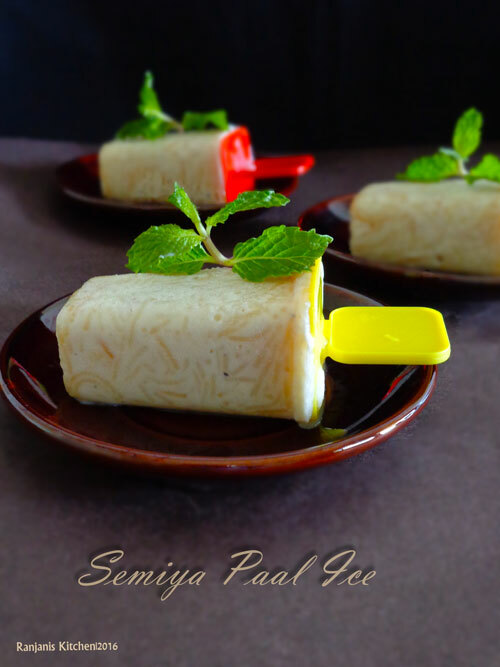 Semiya Paal Ice / Vermicelli popsicle – made with roasted semiya(vermicelli) and creamy milk, flavoured with cardamom. To add-on the taste, I have added some chopped almonds and cashews. 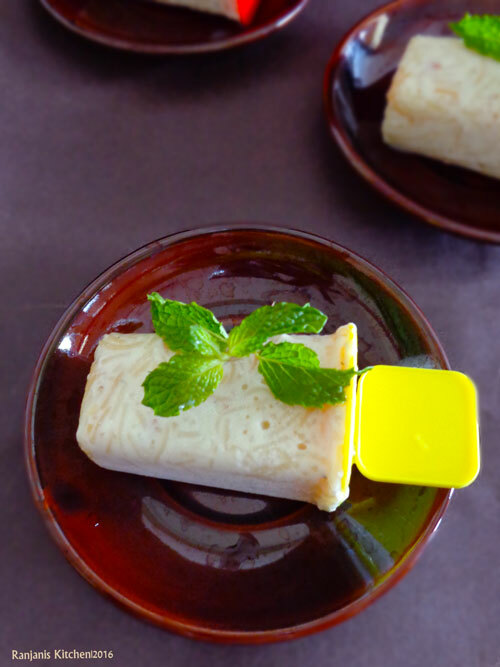 This homemade popsicle recipe is very handy on this summer. Dry roast semiya till it slightly changes to golden brown. 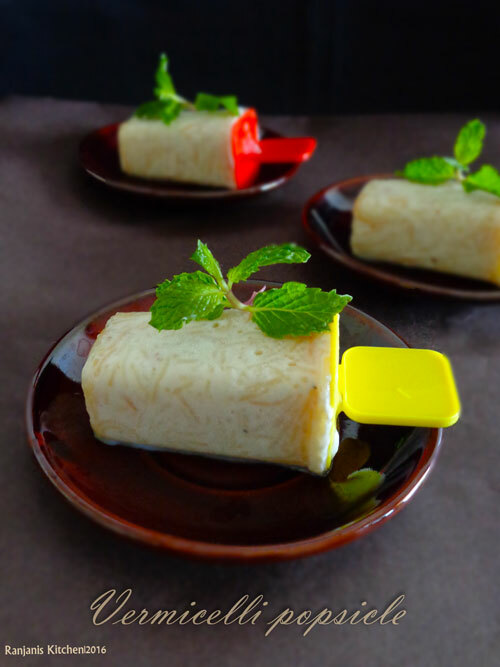 Boil milk, add roasted semiya and cook for 5 minutes. Add sugar, once it dissolves, add cardamom powder and turn off the flame. Add chopped nuts and mix well. 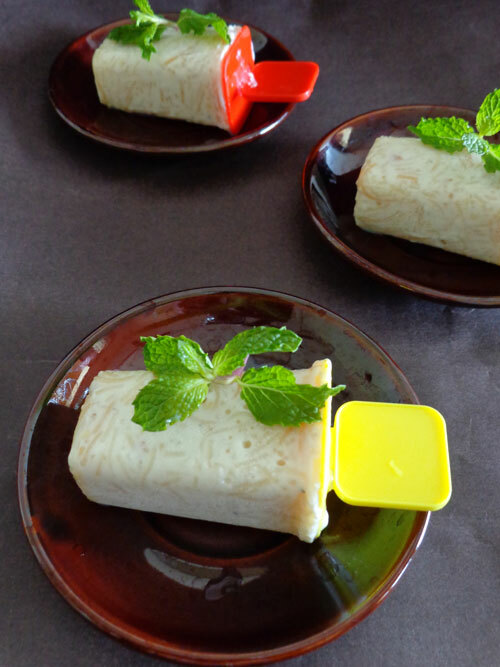 Cool completely and pour into popsicle moulds. Close with lid and freeze for at least 8 hrs or whole night. Before unmold the pops, show the mould base in tap water for secs and you can easily unmold the popsicle. Use vanilla essence or rose-water instead of cardamom powder. A pinch of salt to add in will increase the taste. Addition of nuts is optional. The plain version will also be good. If you gonna use popsticks, after filling the mixture in moulds, cover with aluminium foil or any wrap, prick in the centre using knife to insert sticks.